Incentive Lynx Security, an arm of Incentive FM Group has just been awarded a contract worth in excess of £1.5 million. 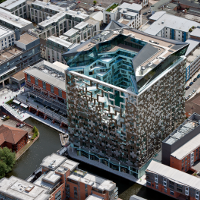 To provide a range of services at The Cube, following a comprehensive and competitive tender. Under the terms of the contract, Incentive Lynx will be responsible for providing manned guarding, residential concierge services and reception cover in a drive to improve service levels and create a culture of service excellence.